In a real tops turvy game we started very slowly and found ourselves 2 down inside the first 20 minutes.We then settled down and we're level by half time with Stephen Burke getting both. Park started the second half the better and missed two gilt edged chances to take the lead, in the hour mark Stephen Burke completed his hat trick to put us ahead.The home team drew level with 15 left and then took the lead with 6 mins remaining , to our credit we kept going and Pimmy Darcy headed home a Stephen Burke free kick right on full time . Cahir Park 2-0 Clonmel Celtic. A big win in tough conditions today against a far tougher, and different Celtic team than our previous fixture. Robert captained our side to this much needed win to keep everyone focused on the league. Zack opened our scoring on 8 minutes and this was doubled by Jack in the 3rd minute of the second half, which was enough for victory. With soft conditions underfoot and continual rain throughout the game, it was tough to play theway we like. Today was great in that some players learned to play effectively in new position's. Absolutely everyone from Adam in goal, who produced a "match of the day" save to Hichem up front....and every substitute worked their socks off for this...and can feel rightly proud of their part today. The squad is developing still. Many thanks again to the U13's for their valuable contribution to the result. Next game is scheduled to be away on Tuesday the 12th to St. Kevin's. Well done to a great bunch of u16 girls who played Peake villa in Duneske with great determination and team work. From the start they dominated the game. Peake villa made use of their extra girl and fresh legs on the line but at times you would think Cahir had the extra girl. The girls did everything asked of them and with plenty of missed chances were unlucky to be beaten 4-2. Cahir Park LMS 31 Started but only 19 Remain, Of those that survived 13 picked Arsenal and 6 went for Chelsea. This saw 12 players crash out this week, 8 had West Ham United and 1 each on Newcastle, Liverpool, Spurs and Stoke City. 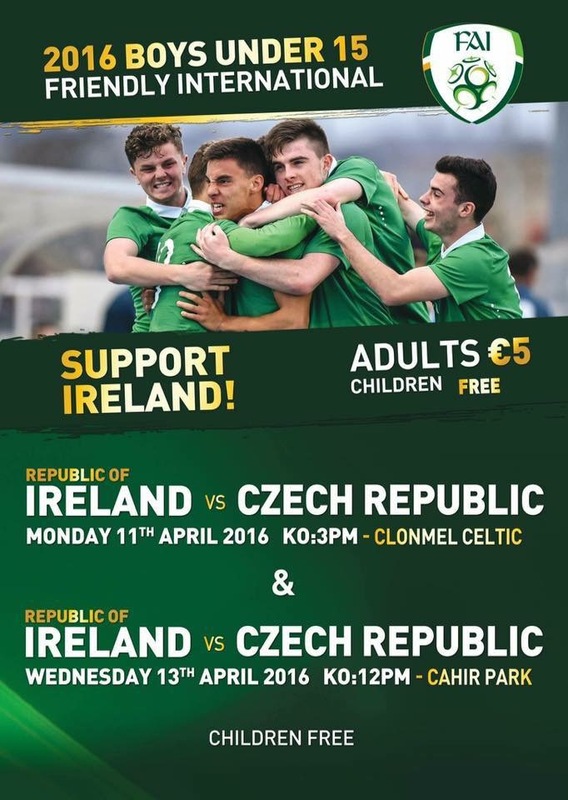 The Cahir Park All Weather Pitch Fundraising. All donations gratefully received. Donate €100 or more to be part of the Friends of Cahir Park €100+ Club. Members of the 100+ Club will be recognized on a plaque in the Clubhouse. Contact any Committee Member.